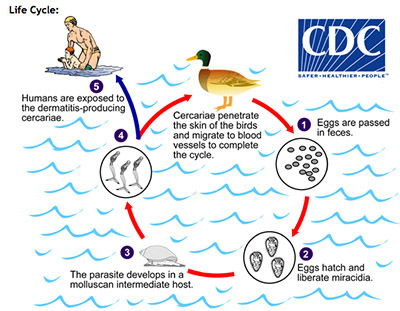 First identified in Douglas Lake, in Michigan, USA, over 70 years ago, swimmers itch (also referred to as cercarial dermatitis, duck itch and schistosome cercarial dermatitis) is a common problem among those that enjoy natural waterways such as lakes, rivers and ponds. The condition is caused by a parasite; small worms that bury themselves beneath the skin and die. The worms die because birds and snails are natural hosts, while humans are not. The swimmer's itch is actually an allergic reaction to the worms. The rash and itch reaction, which happens within hours to days, is typically short-lived; usually about a week. Symptoms will appear in up to 2 days after being exposed. Swimming pools that are properly chlorinated do not spread this condition. Most people do not show any allergic skin reaction when exposed to the protein that causes this condition, so it is possible to see no symptoms or different symptoms from person to person. It is not contagious and most people do not require medical attention. Swimmer's itch is an allergic reaction to a parasite that burrows into the skin. It is found in all bodies of natural water such as oceans, ponds, and lakes. Cases are seen globally and spike higher in warm weather months. Clam diggers itch, schistosome dermatitis, sedge pool itch, lake itch or duck itch. Swimmer's Itch is not contagious. The causes of swimmer’s itch are related to a variety of flatworm parasites, which belong to the Schistosomatidae family. These little critters use hosts, such as snails and birds, to complete their lifecycles, but at one point during their cycle, they leave one host to search for another. If you’re swimming and get in their way, they end up burrowing under your skin, where they die once you leave the water. Their death causes your body’s immune system to respond by breaking out in a red and extremely itchy rash. While it may start out as a mild reaction, it typically escalates and the initial red “spots” become bumpy papules. Each bump is the graveyard of a flatworm that penetrated your skin after you were done swimming. Hosts of the worm that causes swimmer's itch, such as geese, ducks, shorebirds or seaguls have adult worms in the blood vessels. These worms spread eggs that are passed via the feces. When the eggs are exposed to water, they hatch and produce a ciliated miracidium (baby worm) that infects a snail (gastropod) as an intermediate host. The parasite develops in the snail to provide what are called "free swimming cercariae" which are worms that are released. These worms penetrate the skin of any nearby birds and move to the blood vessels. When humans are present instead of snails, the worms will be attracted to the human skin and burrow in when the person leaves the lake as a means of survival during the water evaporation process. Areas, where water collects and gives the worms more time to burrow, such as leg openings or at the waist of a bathing suit, are more susceptible to the "swimmer's itch." The first signs that you may have swimmer’s itch will be a red rash that may or may not itch severely. 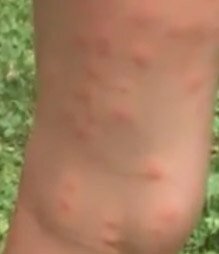 Not all people react to swimmer’s itch in the same way and some may develop a mild irritation to a severe and horrendously itchy red rash. If you do scratch it too much, you run the risk of infection. The degree of your symptoms will largely depend on how many of the worm larvae you get on your skin and how sensitive you happen to be to them. The more you are in the contaminated water, the worse your symptoms may be. Typically, symptoms also get worse with repeated exposure. Some people will start itching virtually the moment you dry off after getting out of the water, as that is when the larvae burrow into your skin. Other will see symptoms such as pimples within 12 hours. You may feel an odd tingly, burning sensation as the larvae start to get under your skin and it may start immediately. Shortly afterwards, you may also see small red dots that will blossom into a larger red rash as time passes. The initial tingle will typically be replaced by a nagging itch that mimics an insect bite or being stung by nettles. Not everyone that comes into contact with the protein in the cercaria that triggers the condition will have a skin reaction (estimated at 30% to 40% of all people show a reaction). Does Swimmer's Itch Leave Scars? Swimmer's itch does not leave scars. In most cases, it will clear up on its' own. 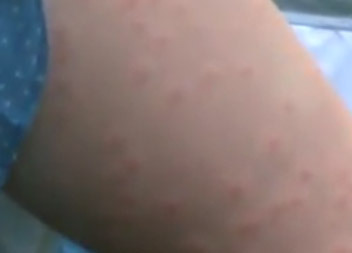 Your doctor will want to know what you have been doing before you broke out into a rash. Once you mention swimming, they will typically give your rash a closer inspection for the telltale signs of swimmer’s itch: small red pimples that may develop into blisters. There are no specific blood tests available to test fo rthe condition. Unfortunately, you may be itching for up to a week, but there are things you may do to ease the swimmer’s itch. 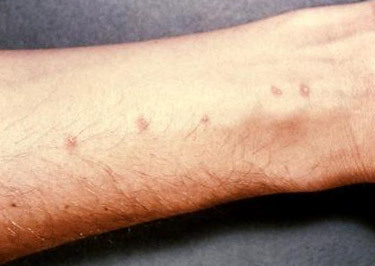 It is possible that the diagnosis for swimmer's itch can get confused with other skin conditions such as herpes, poison ivy, chicken pox or a bacterial skin infection (impetigo). Swimmer's itch looks like chicken pox, but it usually isn't seen in areas that would be covered by a bathing suit. 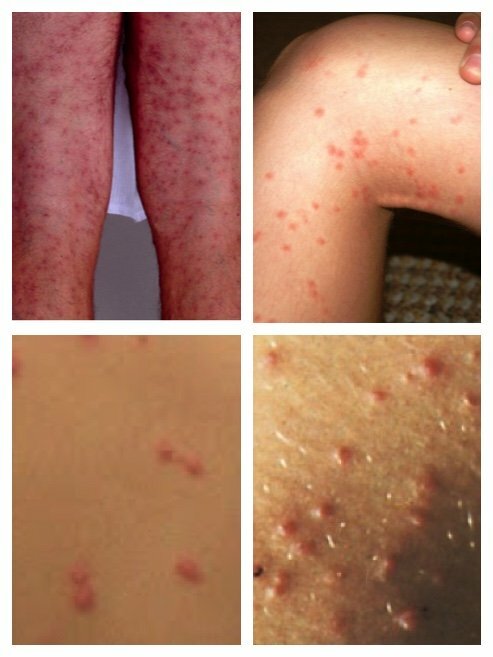 If you do see symptoms in these areas, consider causes such as Chicken Pox or insect bites. Swimmer's Itch vs. Chicken Pox. 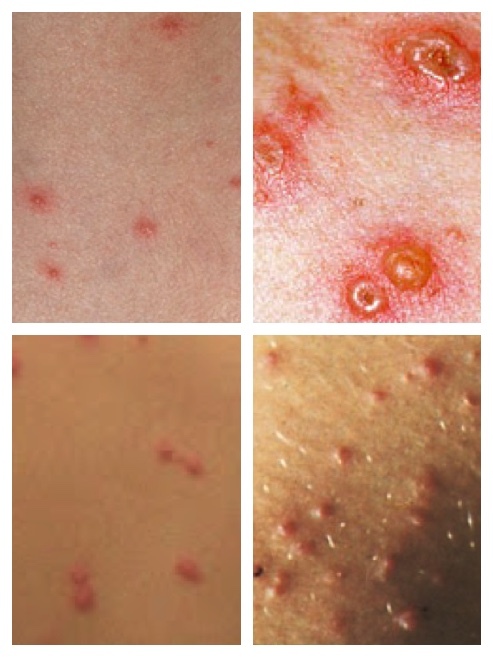 The Chicken Pox (top) goes through three stages, from bumps on the skin, to blisters and then crusts and scabs. Swimmer's Itch lasts up to a week and will gradually go away on its' own. Benzocaine based ointment for itching such as Boil-Ease. Oral antibiotics if your rash becomes infected from scratching. There is no way to completely prevent swimmer's itch. The risk can be reduced by avoiding shallow water (if swimming off a boat, move into deeper water), towel drying after leaving the water, and avoid feeding and attracting water fowl such as geese. More information is available on this swimmers itch fact sheet (PDF download). The application of copper sulfate will reduce the snail population, which will temporarily reduce the incidence of this problem. Use of this product in waterways is tightly regulated and must be approved by your local fisheries office. Call a Doctor if the entire body is covered with skin reactions or if the swimmer itch is very irritating. A Doctor will treat swimmer itch with an antihistamine or topical cortisone cream. For prevention, beware of any posted warning signs. Avoid marshy areas where there are snails. After leaving the water wash off immediately and quickly towel dry. Some parasites enter the skin as the water dries. Do not feed and attract birds near salt or freshwater swimming areas. Swimming pools that are properly maintained are not a risk.